Destiny 2: Forsaken continues to surprise and delight in equal measure, as Guardians discover more of its secrets and rewards in Bungie's wealth of new end-game content for the open world shooter. Most of us have already learnt how to unlock the Dreaming City and how to get Cayde's exotic gun The Ace of Spades in Forsaken, but what about the deceased hunter's prized Sparrow? 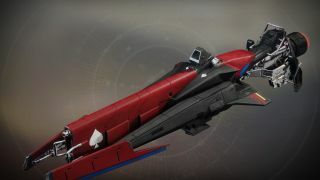 Players have slowly but surely been receiving this Legendary vehicle as a random drop from specified activities in Destiny 2, and news is spreading of its humble brilliance. For one thing, it looks amazing, with that red and black decal and Star Wars-y back thruster giving off exactly the sort of vibes you'd expect from one of Cayde-6's former possessions, but there's material benefits to the Sparrow too. Entitled The Gambler's Palm, the vehicle boasts two perks; the first, Tuned Drive, gives the Sparrow a chance to drop with a 160 speed rating, the highest possible threshold for a Destiny 2 ride of its kind, while the second is a Random Basic Mod dependent on Bungie's new RNG algorithm. As far as we can tell, there's two main activities to grind in Destiny 2: Forsaken for a chance at getting The Gambler's Palm to drop, but make sure you own the expansion, alongside the base game and its Curse of Osiris and Warmind DLCs first. This one's pretty simple. Several Guardians have reported that The Hollowed Lair Strike, in which you fight and defeat The Fanatic Baron boss for the third and final time, is the best place for The Gambler's Palm to drop. Some players have stated that killing other Barons has also given them The Gambler's Palm, too, so these Adventures/Strikes in general aren't a bad choice for seeking it out. There's no guarantee that it'll happen of course, given the randomised nature of loot rolls, but the likelihood of the Sparrow popping up once you've defeated The Fanatic appears to be higher than almost anywhere else in Destiny 2: Forsaken, so start grinding! The second avenue for Gambler's Palm hunters is the official source mentioned by the item itself in-game. Specifically, the Sparrow's bio states that it can be acquired from Completing Wanted Escapee Bounties for The Spider in The Tangled Shore. You can pick these up from the Fallen Vendor in his lair for Ghost Fragments, and completing them offers the chance for The Gambler's Palm to drop, as confirmed by those who already discovered it this way. Wanted Escapee Bounties require you to hunt down and kill a specific enemy in various Lost Sectors, Patrols, and Adventures around the galaxy, and will change and refresh every seven days with the weekly reset. There'll be 14 per week, so you won't be short of Bounties to complete for a chance at getting Cayde's Sparrow though, again, its possibility of dropping is never guaranteed. Nevertheless, these are your best bets for finding The Gambler's Palm, and paying respects to Cayde in style, namely by driving round the galaxy on his super stylised Sparrow. Best of luck, and happy hunting.